at “MIDNIGHT” GRAND FINALE Shocking SURPRISE-ACT???!! transformed as “THE WITCH DOCTOR’S TEMPLE”! BUY 5 F&B Coupons = 500 THB + 1 FREE F&B – COUPON! BUY 10 F&B Coupons = 1,000 THB + 3 FREE F&B – COUPONS! All BBQ – FOODS: only 2 COUPONS! All Alcoholic- DRINKS: only 2 COUPONS! All SOFT- DRINKS: only 1 COUPON! (all incl. 2 free mixers): ONLY 2,200 THB!! *SUPER Prizes for BEST HALLOWEEN CUSTOMS!! 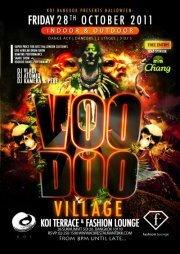 BE READY for the ULTIMATE HALLOWEEN EXPERIENCE..
“VOODOO VILLAGE” at KOI 2011! !